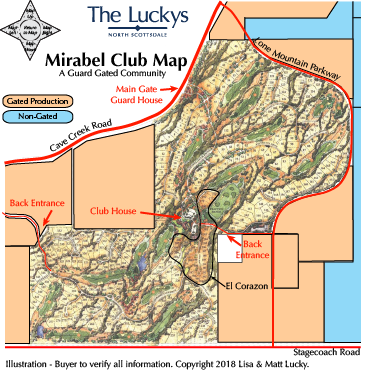 Mirabel Club is a Discovery Land development, situated on 713 acres of pristine desert land at an elevation of nearly 3,000 feet. Mirabel residents enjoy the beauty and pure air of the desert set against panoramic views of majestic mountains, like Pinnacle Peak, Lone Mountain, Black Mountain, the McDowell Mountains, glowing sunsets and the sparkling lights of the valley. Tom Fazio designed golf course offers challenging golf and spectacular views from every hole. In addition to custom homes, Mirabel includes El Corazon. El Corazon is a small neighborhood of 35 beautifully designed single-family homes in the heart of the community. Three and four bedroom floor plans ranging in size from 3,100 to 3,900 sqft. Quality builder with luxury finishes. Each features a courtyard, very nicely finished. Easy walk to the Desert Lodge Clubhouse, tennis courts, pool/spa, and fitness center. See all Mirabel Club - New. 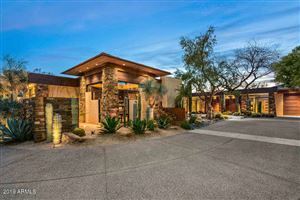 See all Mirabel Club Sold - Desert Mountain.